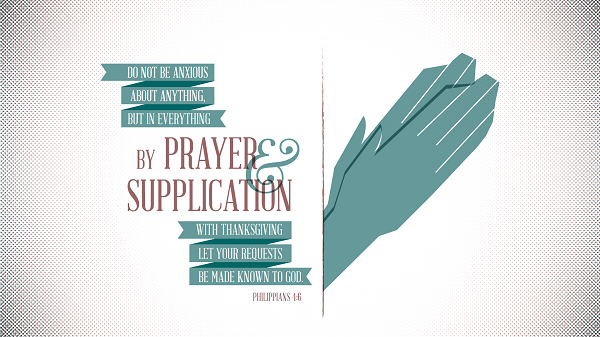 As an antidote for worry, God recommends that we pray constantly: In every thing by prayer and supplication, with thanksgiving, let your requests be made known to God. So not only should we keep up stated times for prayer, but we must pray upon every particular emergency: In every thing by prayer. When anything burdens us, we must ease our minds by prayer; when the going gets tough we must seek direction and support. We must include thanksgiving with our prayers and supplications. We must not only ask for what we want or need, but acknowlege God's provision and mercy. Grateful acknowledgments of what we have maintain a right disposition of mind, and are prevailing motives for further blessings. Prayer is the offering up of our desires to God, or making them known to him: Let your requests be made known to God. Not that God needs to be told either our wants or desires; he knows them better than we can tell him: but he will know them from us, and have us show our regards and concern, express our value of the mercy and sense of our dependence on him. The effect of this will be the peace of God keeping our hearts (v. 7). The peace of God, that is, the comfortable sense of our reconciliation to God and interest in his favour, and the hope of the heavenly blessedness, and enjoyment of God hereafter, which passeth all understanding, is a great good than can be sufficiently valued or duly expressed. It has not entered into the heart of man, 1 Co. 2:9. This peace will keep our hearts and minds through Christ Jesus; it will keep us from sinning under our troubles, and from sinking under them; keep us calm and sedate, without discomposure of passion, and with inward satisfaction. Thou wilt keep him in perfect peace whose mind is stayed on thee, Isa. 26:3.